Medium large country floral wreath and white daisies and lots of greenery. right design has small pink roses, white daisies, large double straw tassels and gold velvet ribbon. Large Victorian decor wreath with fuchsia roses, pink petunias, lots of greenery. large side burgundy bow with pearl streamers. 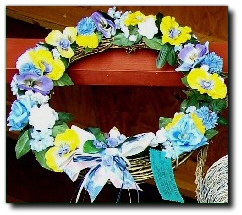 Medium country décor wreath with yellow pansies, white carnations and small pink and white flowers mixed in. White wired ribbon with ivy design and yellow berries. 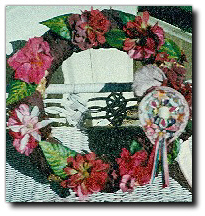 Extra large country wreath with assorted pink, white and yellow flowers and greenery. side bow has large sunflower and bronze metal butterfly. Medium large Star Bud wreath. 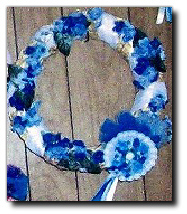 Assorted two toned blue and white flowers, blue netting above the Star Bud corsage which can be worn or left on the wreath. 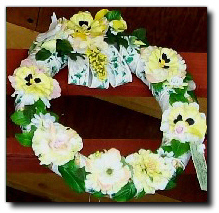 Medium large country Star Bud wreath with white daisies and small yellow and white flowers. 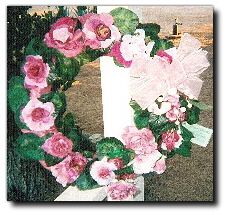 Side Star Bud corsage has lilac and white streamers and can be worn or left on the wreath. 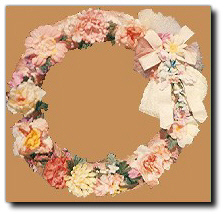 Large Victorian décor wreath made of grapevine with very large double satin pink bow and large pink roses. 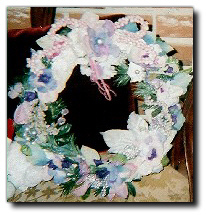 Medium Victorian wreath with many assorted purple, white and lilac flowers. It has a berry bow and lilac and silver beading. Medium Star Bud wreath with pink, amber and orange flowers and greenery. side Star Bud corsage with pink jewel in center and lots of netting and streamers. 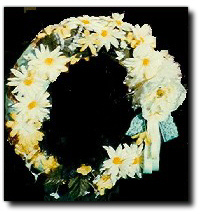 Corsage can be worn or left on the wreath. 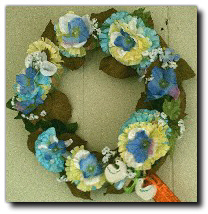 Medium country wreath contains assortment of blue, yellow and white flowers and lots of greenery and baby’s breath and two little white wood ducks. 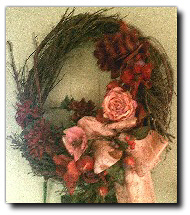 Medium country Victorian wreath with pink, fishier and burgundy flowers and lots of greenery. Side Star Bud has burgundy, blue and fuchsia jewels and a white jewel center. 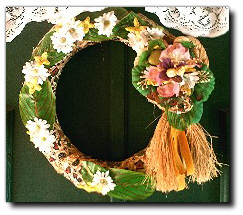 Corsage can be worn or left on the wreath. 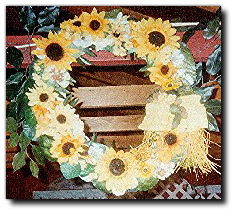 Extra large country sunflower wreath with white daisies and greenery and straw tassels. Medium large Star Bud wreath made of basket weave straw. Contains lots of wild flowers, straw and berries. Center Star Bud floral corsage sits on blue, yellow and cream lace bows. 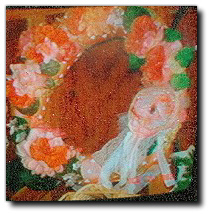 Corsage can be worn or left on the wreath. 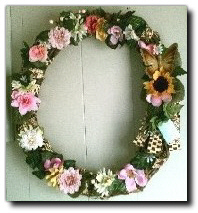 Large country décor wreath with assorted pink, yellow and amber flowers. Side double bow made of wood straw. 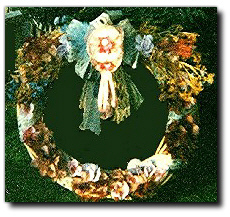 Medium large woven straw wreath. Yellow pansies, small blue carnations, assorted white flowers and lots of greenery. two tone blue organdy bow.